If you’re a bit masochistic, watch Curtin discuss the Open Cup loss some more. Focusing on the playoffs seems to be the only positive thing the Union can talk about this week. Adam Cann talks about the Columbus Crew before Saturday’s match. Playoff positioning on the line, here’s the MLS’ Union v. Crew match preview. Ken Tribbett and Penn FC helped served lunch to the homeless at a local business. Portland had a record-setting sellout crowd for the 2018 NWSL Championship. LAFC’s assistant coach, Marc Dos Santos is the top candidate to become Vancouver’s head coach. The MLS Disciplinary Committee handed down a couple fines and a warning following Week 30. 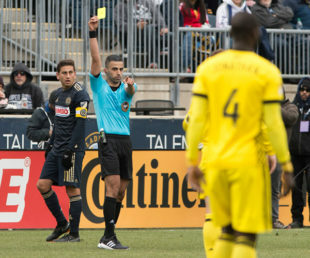 The Independent Panel has spoken, Deklan Wynne’s red card was rescinded. Fernando Bob’s (great name) red card appeal was denied. No, Oscar Pareja is not USMNT’s next head coach, it’s still a mystery. The votes are in and the tribe has spoken, Germany will host the 2024 European Championship. Mourinho and Pogba are near the breaking point at Manchester United. It’s official, Ronaldo will play his former club at Old Trafford, serving only a one game ban for his red card.